Location: South Lakeland, Cumbria, England. 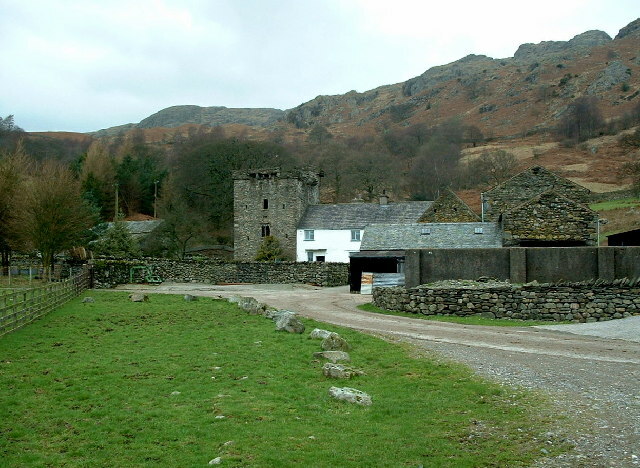 Notes: Kentmere Hall is famous for its tower house; a fortification built for status in the 13th - early 14th centuries - ostensibly to guard against raiding parties from Scotland. Similar towers occur elsewhere in Cumbria and other northern English and southern Scottish counties. Kentmere Hall's tower has 5-foot-thick (1.5 m) walls, tunnel-vaulted ceilings, a crenellated roof with turrets and a spiral staircase; all built out of local stone. The farmstead to the east of it shows signs of many building phases and changes, in common with many other significant Lake District valley bottom medieval and post-medieval buildings such as Dalegarth Hall in Eskdale. The manor, having been handed down to the eldest son, the rest of the valley was divided between the younger sons of the Gilpins for generations. What remains of the original estate is now a farm in possession of a private owner. Other important parts of the manor include Green Quarter on the eastern slopes of the valley where there is a bed and breakfast house, called Maggs Howe, that once was home to a branch of the Gilpin family.